Have you ever had one of those Six Degrees of Separation moments, in which the cosmos aligns itself around a common theme? Early this morning, I awoke to a comment from fellow blogger Aaron Graham. He liked my post about shopping for bras, and I loved his diatribe about Star Wars Episode I enough to return the favor. I hadn’t thought about Star Wars in a long time. I saw the first movie with my dad when I was 10, and I became and instant fan. I gobbled up the two sequels greedily, and I pinched every sol to buy a copy of John Williams’ soundtrack. But after the first three films, something horrible happened: With Episode I, George Lucas dazzled himself with his own Industrial Light and Magic. Suddenly, the motion of Jar Jar Binks’ ears—and selling video games—was more important than telling a story. By the end of the film I was so disgusted that I vowed to avoid any future Star Wars movies. I feared I’d lost my love for Star Wars and that I’d never be able to recapture that early sense of wonder. But then, this afternoon I opened the July 2011 issue of Popular Photography. 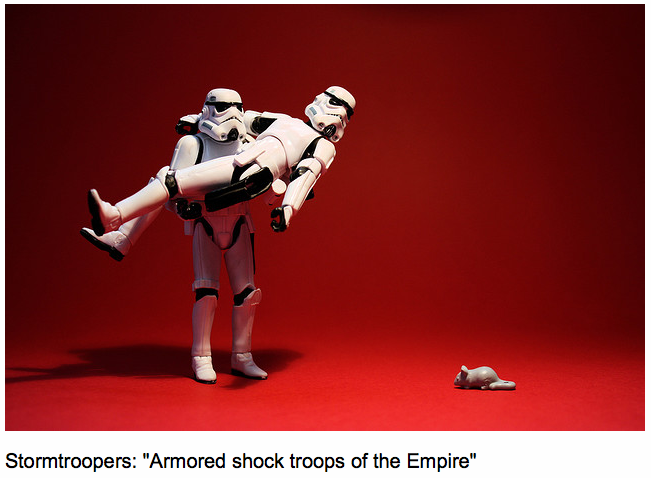 Among the articles was a brief about French photographer Stéfan le Du, who has spent the last year photographing Stormtroopers in unlikely situations. I was amused by the droll situations he concocted with his figurines. So … hats off to Aaron for his eloquent protest against Episode 1, and to Stéfan for his brilliant and ingenious photos. Between you, you’ve helped me appreciate Star Wars through new eyes. Amazing photos! It inspires me to go a little wilder with my own action figures. I’m with ya: I’m actually thinking about *buying* some action figures! Thanks for reading, Lazy But Righteous! Great pics. What could be done with “Rugrats meets Snow White”? Tommy Pickles can be Prince Charming and Angelica definitely has to be the evil Queen. But which rugrats will play the seven dwarfs? . Oh. My. GOD. This is too funny — thank you so much for sharing! Oh wow…I can’t tell you just how happy this entire post made me. I LOVE Star Wars, and this post made me laugh so hard! ::) << That's me smiling back, with my four eyes. Thanks for reading! I have seen Stefan’s work previously and have always loved it. Awesome! Thanks for sharing! I love these! Great job. 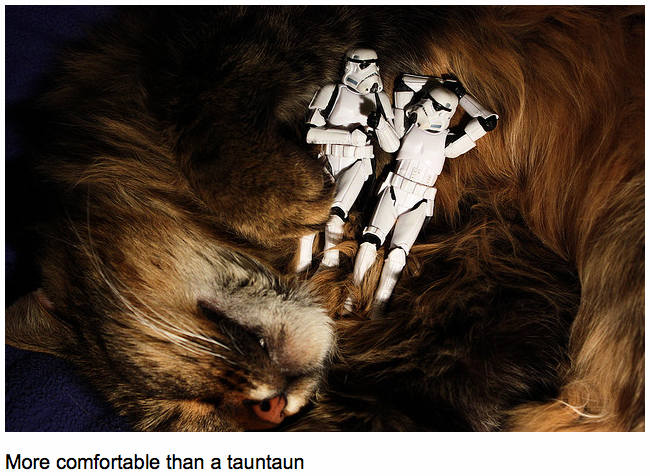 I just wouldn’t want to be the Storm Troopers when kitty wakes up. 🙂 Brilliant!!! Reminds me of Yaks pub in the Rebelscum forums. Quel video è divertente — ho riso alto fuori! Mille grazie, Glipkerio!! I’m with ya, Eric: Of all of Stéfan’s photos, that one made me laugh the loudest. Hahah this is the funniest thing! Great job! Super creative! Beautifully awesome!! Wow!! I’m rising to a standing ovation right now. Brilliant! Really great pics and story! Like your writing style! So you know I didn’t actually *shoot* these photos, right? I just wrote about someone else’s BRILLIANT work. But my other half would agree with your other half: I need a new hobby. 🙂 Thanks for reading — and especially for commenting. Everything is cuter in miniature! 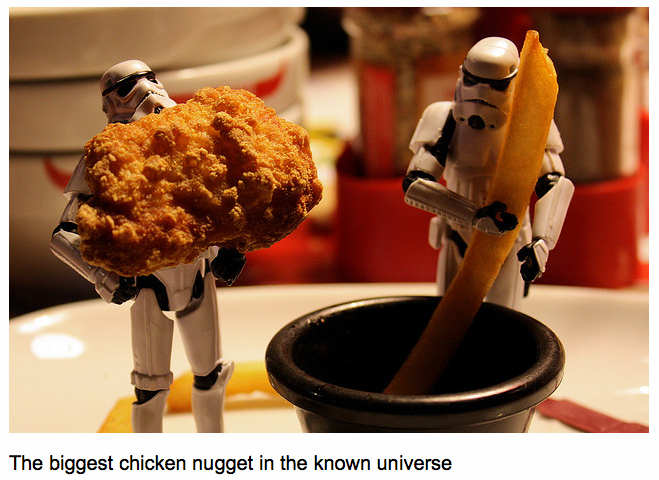 Now I want a chicken nugget. Humorous! The photographer must have boundless imagination. Very funny! My 6 yr. old who is obsessed w/ Star Wars right now loved this too. Absolutely wonderful! Such an expressive and droll look at the world and what a creative use of the basic action figure. Brilliant! Caught some of these before, but I’ll be passing them all along to Middel Weasel, who nearly rivals my Star Wars Fandom…. Thanks for shaaaaaaaring ! Too cool ! I love the chalkboard one and the Titanic one. Amazing. well shot pictures. I agree with you: The photos are technically superb. Hats off to Stéfan. I wish I had half his skill as a photographer — and one-tenth his imagination. Thanks for reading! Awesome! Very unique. I love the pictures! Ha ha – great pics. Love these! The optician-type placard one is brilliant. Thanks for posting! Hilarious! The perfect actions figures to use too! aahhhhh! just what a i needed. thanks for the great pictures, hilarious captions and the tears from laughter. good stuff. I’m with you – I thought the so-called episodes 1-3 ruined the Star Wars saga and left them forever blighted for me as well. Loved the photos and glad you shared them with us today. Star Wars episodes 4-6 can now proudly rise above Jar Jar and all of George L’s other nonsense that tainted the series. Congrats on being FP’d! Why thanks HBlog. Always glad to have you stop by. the images are hilarious. I love star wars and I love this post. good job! I can’t take credit for the images, of course — but I”m glad you loved the post. Thank you!! ¡Mil gracias por su comentario, anisette! ¿Usted prefiere escribir en español — ou en français? J’aime également les deux! Si quiere, por favor envíeme un email. J’aimerias, bien avoir “pen pal” en un idioma que no sea el inglés. Salut, et merci mille fois! Haha! 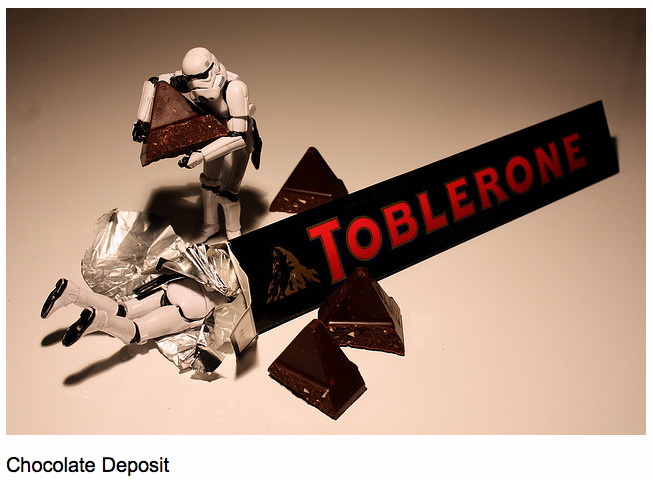 My boss uses these photographs in her PowerPoint presentations, and it is hilarious! I always wondered where she got the pictures from. You are right, the masks are the trick. What are those two thinking about anyway? I share your opinion on the new movies. Not the same, not the story. Are you allowed to republish the last 3 photographs or no? Im not sure if Stéfan le Du would be too happy about that. Fair question: rodb2. I don’t know how Stéfan le Du might feel about the publicity. But since all of these photos have already been published by Popular Photography, and The Guardian, and The Daily Telegraph — and since I give him full attribution, plus a link to his Flickr page — I would hope he’d be OK with my post. But I’ll drop him a note just to make sure. Thanks for your comment! I especially love the ‘Titanic: Portrait Scene.’ These photos are an awesome find! If only life were this simple and amusing all the time! Hahahaha oh my goodness!! Thank you so much for sharing these—they have made my night!!! 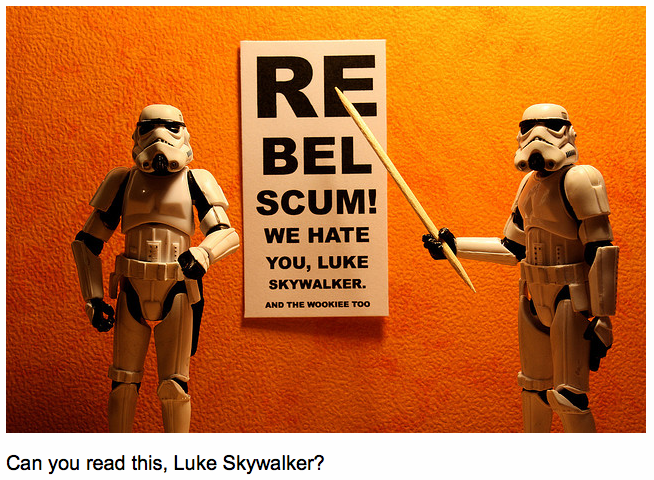 I love the eye chart one… so funny. The first time I saw Episode 1 in the theater, my uncle asked me how I liked it and I said, “Well, there really isn’t much to it.” I mean the acting is terrible, every time little Skywalker open’s his mouth I have to choke down my own vomit. The scene where Anakin’s mother explains she was impregnated by the force and gave birth as a virgin I laughed out loud. Nothing but flashy effects and poor dialog. PS – What’s up with Darth Maul, he has two or three small scenes the entire movie and then show’s up out of nowhere at the end, kills what’s his name and get’s sliced in half, he was absolutely pointless. PPS – I love the pictures, they made my day, thank you! My favorite is the Titanic one, that hit my funny bone pretty hard. PS I want to see about doing something similar in my free time. Hopefully I could be just as funny with some Star Trek figures. I loved the Titanic one. Great post! This is so hilarious! I love it! Love the Titanic pose! 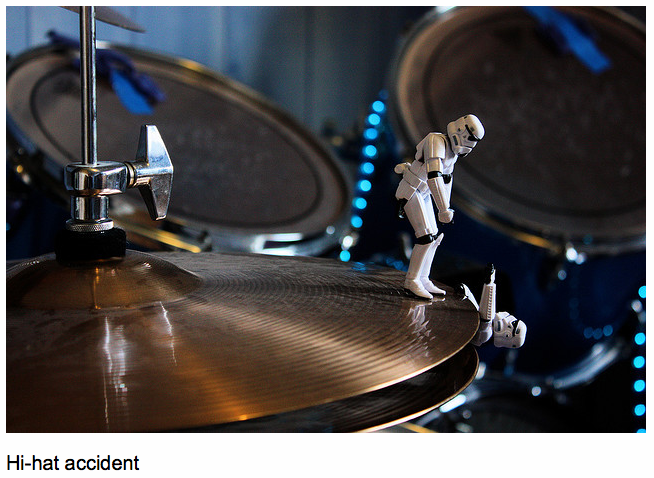 Loved the photos and the hi-hat accident! So creative and humorous. I have 50 of the original figures – mostly in their sealed packages. Since I have not been able to sell them, I am ready to create a whole new stop action story of my own. You are such an inspiration! I’m so glad you liked my post! Though I really must give Stéfan le Du all the props … he came up with the brilliant idea. But if you decide to do your own stop action story, please do drop me a note. I’d love to see what you come up with! Hey, Edwin! Thanks so much for your kind words. I just visited your blog and it’s WONDERFUL. Thanks for starting my day with a laugh! Very fun. . . and brings the joy of Star Wars back! Congrats on being FPed. Thanks so much, Patti! 🙂 Love your blog, by the way. Never thought I’d see a George Carlin reference and a post about hummingbirds on the same page. You’re my kind of gal! Ha, that made me laugh! Thanks for a good start to the morning, and congrats on Freshly Pressed. 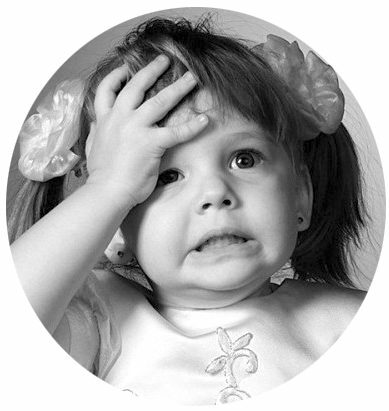 Love the blog and love the pictures, makes mine look a little weak …I need to start thinking outside the box !!! Your blog is *far* from weak, milezaway! (Loved your Venezuela photos!) One of the best lessons I’ve learned from blogging is that one musn’t compare oneself to other bloggers. It’s OK to draw inspiration, of course, but it’s important to remain true to one’s voice. So keep up your admirable work — and an enormous thanks for your kind words. Oh, these are greats. I totally agree with you that George Lucas is out of his nutter and needs to stop killing Star Wars right away. Though I love it when I see something like this which uses the characters in a new and humorous way. Have you seen Robot Chicken Star Wars? I think you would love it. Congratulations on being the first to mention Robot Chicken! Yes, I’ve seen it — and yes, I love it! Hardware Wars is pretty good, as well. I especially love the underside of the flying iron as an Imperial Cruiser. Anyway … thanks for reading! Now these are creative and funny! As kids, my brother and I were really into Star Wars. 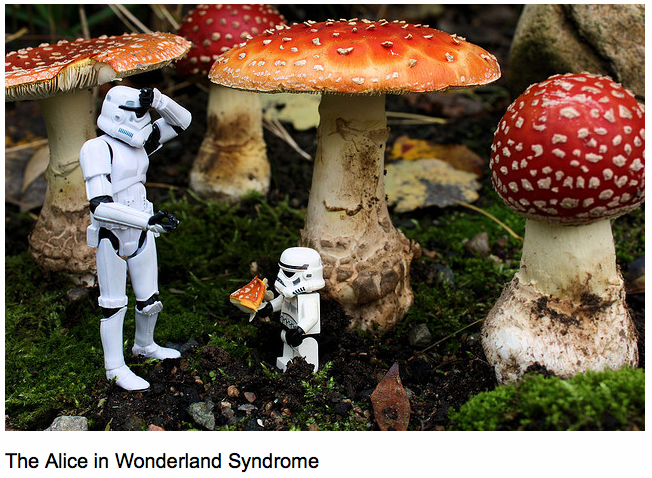 It’s hilarious to see these photos of Stormtroopers in odd situations. But, hey, why can’t they enjoy chicken nuggets, crepes, and Toblerone? Chicken nuggets, crepes, and a Toblerone …. sounds like the meal of my dreams. 🙂 Thanks so much for reading! 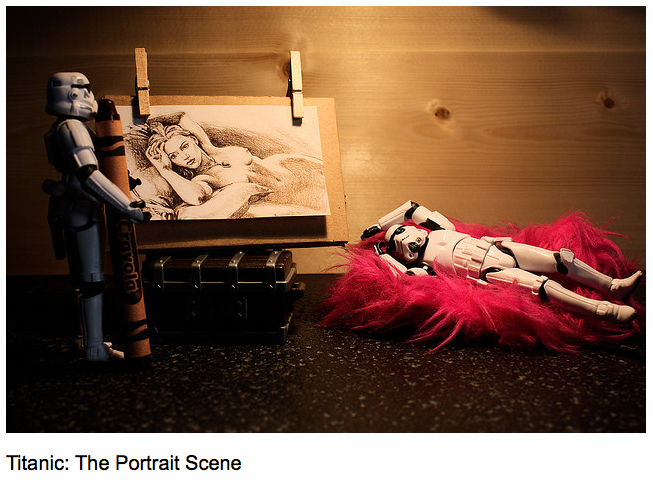 star wars action figures are cool but your pictures and captions made them super-cool and funny! congrats! Great post! Stéfan’s photos are great. The photos remind me of a blog I follow called ‘a LEGO a day’. You should check it out! Very Fun! I only watched the first two, then I was the same about the more “modern” prequel. That was NOT Star Wars worthy. 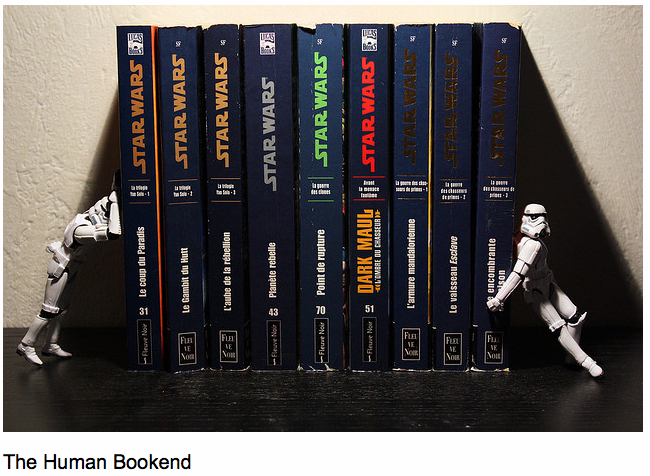 I may have to re-blog this for all of my Star Wars junky fans! Have a great weekend !!! Wow! How long have I NOT been looking at these pictures? I know what you mean. My life had been so empty, somehow, until I saw Stéfan’s hilarious photos. 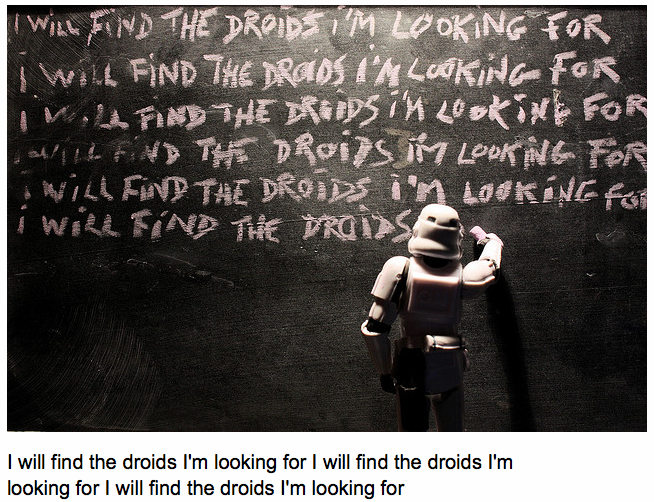 This is a great story and fun illustration of the droids playfulness. Hope ya don’t mind that I tweeted this. Those little creatures are hysterical when put together like that. Never would have stumbled upon this if it didn’t come up in Freshly Pressed! but I’m glad I did. Naw, I don’t at all mind being tweeted. Glad my post brought a smile — and thanks for sharing the love! great post! I have seen these pics before and love them! Thanks for sharing. Thanks for sharing, I love any bigger context for Star Wars – also amazing: the animated Lego graphics of Darth Vader in the canteen of the Death Star (although it is really old)…thanks again, made me smile. Priceless!! Congrats on being Freshly Pressed!! Glad you enjoyed this! Please feel free to repost (thanks for asking!). And good luck finding your old action figures! … and your comment made *my* day, my darling! Thanks so much. LOL! I recently purchased the “Many faces of Darth Vader” t-shirt for my son – our whole family are fans….but, since I’m only girl in a houseful of males, I wonder…. The first year hubby bought me a Barbie for Christmas was the year the boys got GI Joes with all the trimmings: boat, car, motorbike, weapons galore…. Tears in my eyes for my precious Barbie, I thanked hubby for the well planned and thoughtful gift. Got here by chance as your blog is on the FP, and I don’t regret it one bit. Great blog! I was intrigued by the title as my 3-year old is a big fan of both Toy Story and Star Wars (although he has never seen a Star Wars movie, proof that Lucas’ marketing strategy works). I hooked off after Episode I, never came back for II and III, for me, it had lost the magic of Episodes IV, V and VI, or are we just being nostalgic here? Loved the pictures too. Will definately come back regularly to read more. Hahahahahahaha… just so much fun… I am so glad I stepped somewhere and fell on your blog, good one, can’t stop laughin’ though ! So glad you liked it! I’ll try to keep the smiles coming! Wow my God ! It just made my day ! Nice done ! I’ll share it. Merci beaucoup pour votre commentaire ! Ça fait beaucoup de plaisir — et j’adore votre “avatar.” C’est vraiment beau, ça. Bonne journée ! Wow. That was funny and unexpected. Haven’t heard about them for quite some time now. It was easy to lose interest. These pictures were phenomenal and more than hysterical. Great post. And congrats on FP! Thanks, Logophile! Funny and unexpected are good — especially when they happen together. And thanks for your kind words. Being FP has been a bit overwhelming this time, but in a good (funny and unexpected!) way. Cheers! I’m so glad to see storm troopers gainfully employed again. Things have been tough since the empire fell. a great post. Ha ha! Great comment. Thanks! I still can’t get over the fact that my parents threw away all my Star Wars figures from when I was a kid. Look at all the fun I could be having! That’s so funny! I’ve always wanted to try pictures like that, but I don’t have the camera for it! I love the height difference in” The Alice in Wonderland Syndrome”. I’m not a Star Wars fan but these are frickin’ hilarious! 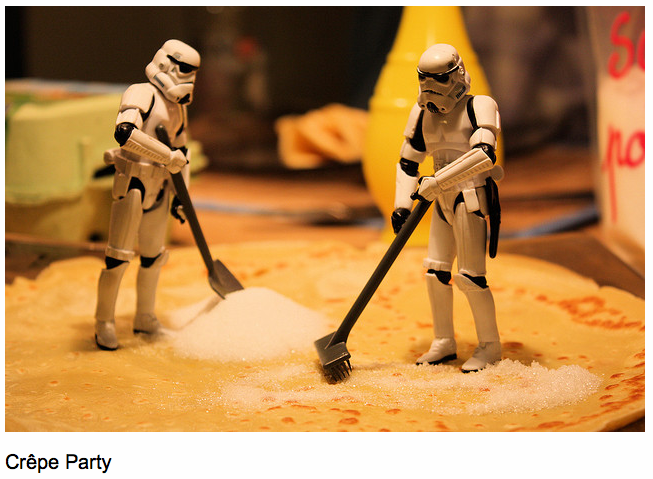 I never would have thought of Storm Troopers in such a fun way! I’d like to see what this guy could do with a whole Company’s worth of soldiers?! The more the merrier right, 100+ soldiers in a picture such as these could be hilarious! I’m with ya, Noah: I’d love to see what Stéfan could do with 100 action figs. Maybe we should take up a collection and start building him an army?! Funny! I love those two lounging on the sleeping cat. All credit for the incredibly inventive photos goes to Stéfan le Du. I highly recommend his Flickr page (link provided in the blog post). Thanks for reading — and especially for commenting!